To order a DVD of Liquid Wind send $14.50 via check or money order to the above address. 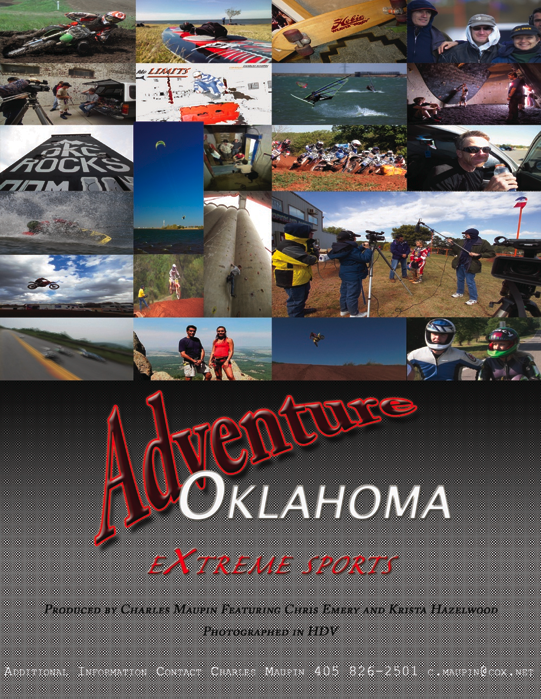 Charles Maupin has successfully completed his new, much-anticipated extreme sport documentary program, Adventure Oklahoma: Extreme Sports. Featuring Chris Emery and Krista Hazelwood, this action packed look at the wide array of extreme sports taking place across Oklahoma has aired on Cox Cable and Oklahoma's state-wide PBS station, OETA. Check your local listings for more airdates. For distribution information or to schedule a screening in your area, contact Charles Maupin at 405.826.2501 or e-mail c.maupin@cox.net. Liquid Wind is an intense look at the kiteboarding and windsurfing phenomenon on Lake Hefner in Oklahoma City, Oklahoma. Musical contributions from Oklahoma artists Grey, Jon Carrube , Chris Stephens, Brad Davis, Mary Catherine Reynolds, and Louise Goldberg provide the musical soundtrack for the film. The project includes interviews with top Oklahoma windsurfers and kiteboarders, weather experts, and those responsible for bringing this extreme water sport to Lake Hefner. Among the windsurfers and kiteboarders featured are Jeff Shelley, Daniel Nicholson, Bryan Dobry, Nick Tubre, Kevin McCaleb, and Jeff McClung. Co-Founder of the Central Oklahoma Boardsailing Association, Bruce Robertson, assists City Manager, Jim Couch, in explaining how windsurfing and kiteboarding began at Lake Hefner. German Director Michael Knof makes a cameo appearance when his son, Lewis Lindenberg, is injured in a kiteboarding accident. Lindenberg explains how he crashed into the rocks surrounding Lake Hefner, sustaining injuries to his hip, knees, and pelvis. KFOR-TV Meteorologist Mike Morgan explains the geographical and meteorological conditions that must exist for great windsurfing on Lake Hefner. All the music featured in Liquid Wind is the work of Oklahoma's local musicians. Jon Carrube's "Long Day" was recorded specifically for the documentary at Champagne Studios, and is featured for one of two music videos in the documentary. The techno stylings of Chris Stephens and Brad Davis have 9 songs featured in Liquid Wind which are heard throughout the documentary. Grey's track "Joyous Occasion", a psychedelic favorite on mp3.com, is the featured song of the second music video piece. Mary Catherine Reynolds and Louise Goldberg contribute the track, "Mourning Dove" featured in a section focusing on the family and female windsurfers. Liquid Wind is the work of Producer Charles Maupin of the Independent Filmmakers of Oklahoma. 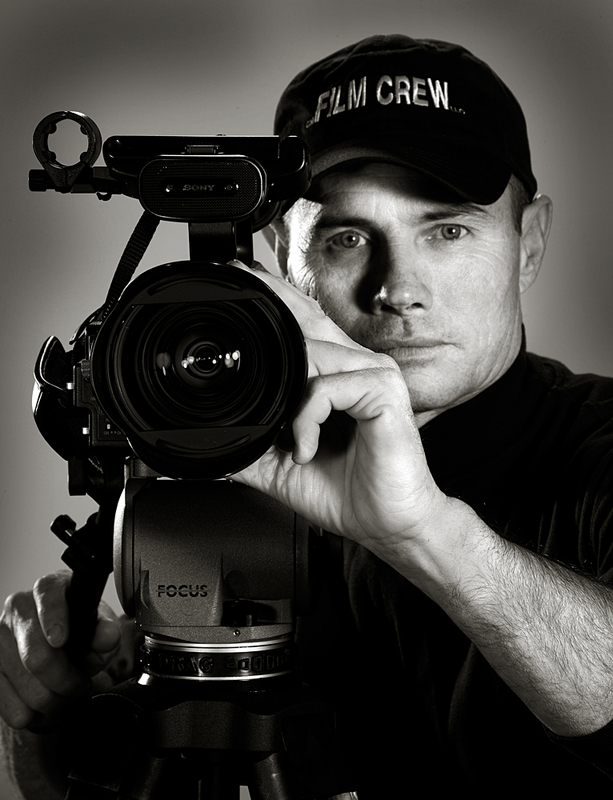 On this project, Maupin doubles as both Producer and Director of Photography. James Murati served as Still Photographer and Technical Consultant for the project. Maggie Abel provided the CG titling, and assisted Maupin as Camera Operator. The project was edited at Screaming Butterfly Productions by Diana Kettle. Kettle, working with Tim Eck, previously was awarded Best Music Video at the Bare Bones International Film Festival. Kettle was recently named Pegasys Producer of the Year for 2003 & 2004, and previously was Editor of the Year for 2002. The film aired three times on OETA, was featured in an article in Kiteboarding Magazine (pg 31 of the March 2005 issue), won Best Film Trailer at the 2004 Bare Bones Film Festival, Best Sports Show at the 2004 PEGASYS VideoFest, and also screened at the 2004 DeadCenter Film Festival and Digital Independent Film Festival.